The world should rise against Israel’s "racist" regime, says the man who is in charge of peace talks on behalf of the PA.
Israel’s regime is “racist” and should be punished, the man who is in charge of peace talks on behalf of the Palestinian Authority (PA) said Tuesday. Speaking to the Bethlehem-based Ma’an news agency, the PA’s chief negotiator Saeb Erekat referred to the heated argument he had with Justice Minister Tzipi Livni, Israel’s negotiator with the PA, during the Munich Security Conference this past weekend. 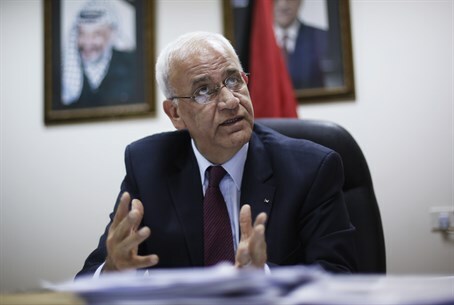 Erekat said that the reason for the argument was Livni’s insistence that the PA recognize Israel as a Jewish state as part of a future agreement. “I told her in front of the whole world that we will not change our history, our religion or our civilization,” he said. “We are the lawful sons of Palestine; we will not accept Israel as a Jewish state”. “Livni accused us of not wanting peace, and I told her that Israel is racist against Palestinians in ways that did not happen in South Africa. The world should rise against this racist regime, hold it accountable and punish it,” he charged. This is not the first time that Erekat has slammed Israel as racist. Last May, he accused Israel of applying a policy of apartheid in Judea, Samaria and eastern Jerusalem. "Today in the West Bank, including East Jerusalem ... I can sum up the situation with one word - apartheid. Worse than that which existed in South Africa," Erekat claimed at the time, adding, "Today Israel justifies its apartheid by the term security." Just last week, Erekat rejected Prime Minister Binyamin Netanyahu’s idea that if a Palestinian state is established in Judea and Samaria, Jews who wish to remain in that state should be allowed to do so. Erekat also told Ma’an that a recent meeting with U.S. Secretary of State John Kerry made no progress and a date for a framework agreement was yet to be set. He accused Israel of having announced more than 10,000 “settler homes”, having demolished over 219 PA homes and killed over 40 Palestinian Arabs since restarting peace talks last July. Erekat said that Israel should be held accountable by the international community, and not just condemned and denounced. The comments come just one day after Erekat slammed the Israeli government and said that the PA won’t recognize Israel as a Jewish state because Israel has not “recognized the state of Palestine within the 1967 borders."